A certain blogger suggests and I quote " Comfort food is Good for the Soul." I guess what foods you declare comfort food is based on individual tastes and memories. For example, when I was really young, I remember my lola (Grandma) preparing Kaldereta for lunch. Yes, only in our home do we have a feast of my lola's special recipe every other day. Now when I prepare my own version of Adobong Manok at home, it conjures up great memories of those earlier meals and is “comforting.” I’m sure we all have these memories. Today, most people would say, "ahh my comfort food is chocolate," or foodies may think of meals like beef stew, pasta, braised beef, lamb or pork shanks & homemade soups as their favorite comfort foods. Did I mention mashed potatoes? But then again, a juicy cheeseburger grilled outside in the summer is also comforting and brings back memories of my dad starting the charcoal grill in our backyard. He would get busy with some project he might be working on and forget about the burgers or the chicken pieces and they would have a crispy exterior but we still enjoyed the food and loved the event. So before I go too far down memory lane, let me tell you more about the "Comfort Foods" that Naci has to offer. Nadine Nocom describes food that will “soothe your soul – and your stomach – with homemade favorites,” innovated by Executive Chef, Chef Ed Quimson. Nads as she's known, is the young owner and Genenral Manager of Nacy, shared her joy and family's love for foods that brought comfort and delight not only to her but to the whole family and numerous friends. Chef Ed Quimson on the other hand has worked at prestigious establishments such as La Tasca, Via Mare, The Nielsen Tower and more. Let me just share a horrible experience Bhogs and I had with Kani Mango Salad at one of the restos at McKinley Hill. Horrible in the sense that we had to wait for like 30 minutes for a mere small plate of that dish, though it was good, but we thought and got discouraged telling each other how a simple a salad as such would take that long to prepare, heck you don't even need to cook it, you just shred everything to pieces and top with the dressing. However, the salad as good as Naci's Kani Mango Salad, I don't mind waiting for even for an hour. I like how they have added the fried vermicelli not only for appeal but adding more to the crunch you get from the fresh veggies. and that darn wasabi putting a kick into the dressing. From the top, Shrimp Jambalaya, Fox Square Fish Fillet and Peruvian Chicken Rice. As Nads adds, "We offer food meant to be shared and enjoyed with good company, the homey atmosphere and attentive service at Naci will allow our diners to sample a variety of creative noshes as a light snack or entire meal in very affordable prices." I was able to savor all the dishes featured here but the front-runners are Chorizo and Brie Puffs (cause of the banana inside the puff setting a play between the saltiness of the chorizo and sweetness form the banana), Shrimp Jambalaya, and the Sardine and Onion Pasta. Having a mild spicy note on the Shrimp Jambalaya is perfect for a simple rice meal, even a kid would love. What is so amusing with how the menu was conceptualized was that, each family members have a dish most dear and named after them. After all they are all pitching in as they build up the staffing. Like Nadine's Adobo Cannellloni, Tita Em's Chowder (which I must say captured the clam chowder known to San Francisco dwellers), Nate's Steak and Eggs -inspired by her brother Nathan, who takes care of the bar. The so called Naci however enlivened from the father's name which is Nacy. The Ignacio "Nacy" Nocom of what used to be the Cosmopolitan Bar, married to an actress named Lovely Rivero. And now let me take you to heaven here on Connecticut, Greenhills as I bring you part of their dessert bar, which will welcome you as you enter the restaurant. Melt-in-your-mouth dark Belgian Chocolate Ganache sandwiched between generous layers of moist dark chocolate sponge. Classic Red Velvet cake smothered with our tangy vanilla cream cheese frosting. A Chocoholics’ kryptonite: A flourless melange of premium Belgian chocolate, fresh eggs and butter enrobed in a dark chocolate strip and finished with chocolate whipped cream. 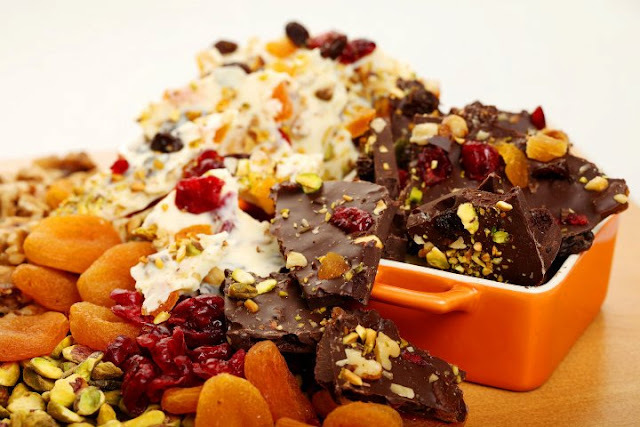 Shards of premium dark Belgian chocolate studded with dried apricots and cranberries, walnuts, and raisins. Also available in White and Milk Belgian Chocolate. Mind you, as good as they get, they are not that pricey, a top-notched cake slice can only cost P100 and thus you may need to prepare an amount more than that, else you'll be coming back and be haunted in your dreams if not fully satisfied with just one choice. My choice of comfort food would be cheesecakes, and chocolate cakes for my tiny tots. So we won't mind coming back often for the Mango, Cherry and Razz (Raspberry) Cheesecakes. Well I'm going to be sure you won't be leaving the place the first time you stop over without getting your forks loaded with L’Opera Torte - a French classic which has layers of almond sponge, Belgian chocolate ganache and coffee-infused buttercream and L’Opera Raspberry - a playful interpretation of the classic L’Opera with layers of almond sponge, Belgian milk chocolate ganache and raspberry buttercream. Not bad at all for the first ever dessert bar in Manila. I'm sure treasured memories will be coming back once you've experienced the dining comfort of NACI. Hi Meika! Tnx for dropping! Hope to see you again soon!